They are called "Whirl A Copters" and you can get them at Party City for .35 each! I rushed out and got a dozen, came home and measured and came up with this design. I designed it to fit a 4 x 6 size, so I uploaded it to Sam's Photo (I just joined Sam's, so with a new photo account registration I got 25 prints for free!) and went and picked them up an hour later. Perfect! 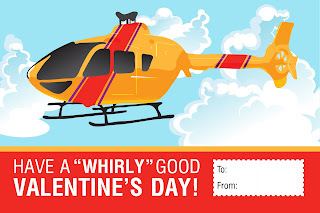 Then I punched a hole at the top of the helicopter and at the bottom of the card and slid the Whirl-a-copter in. When I showed it to my son, he gave me a look like, "you are the best mom ever." I never get tired of that look : ) What made this extra special for us is he calls helicopters "whirly-birds" because we heard it on a video about helicopters one time and it just stuck. 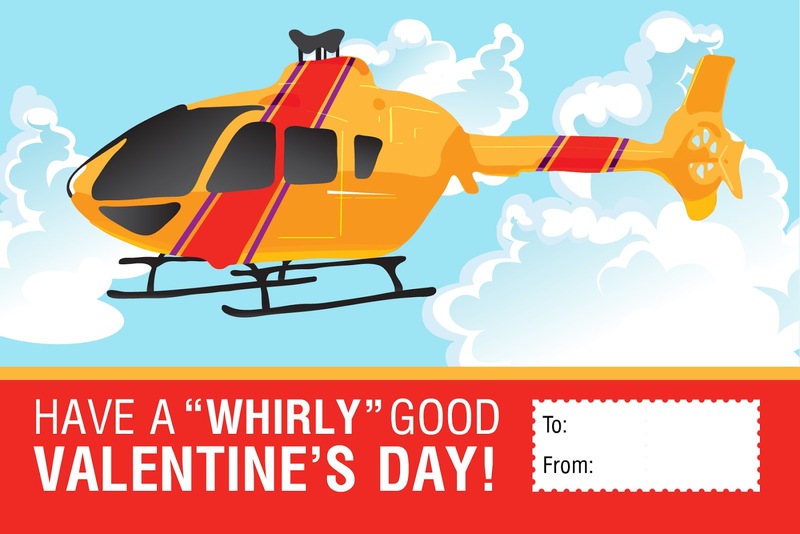 So a "Whirly" good Valentine's Day was right up his alley. 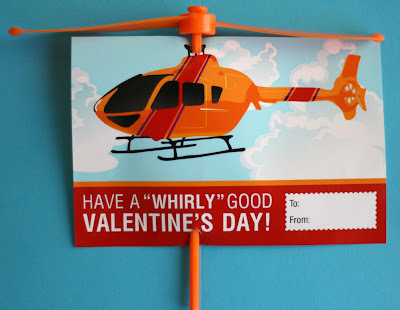 It's awesome, because there is just enough clearance at the top of the card to spin the copter around and it looks like the helicopter is really flying. I can just see all the kids playing with it. They will love it. The teacher on the other hand, may not feel the same. Sorry. If you would like to give it a whirl (he, he), here is both a JPEG you could use for photo prints like I did, or a PDF to just print out on your own. Happy Valentine's! Thank you SO much for these! As an elementary school teacher, candy has just run its course as a treat for the kids. My students are just going to LOVE getting these - as well as being an awesome mom for my sons when the holiday comes around for them.